Last week I went along to the eagerly awaited launch of Sarah Brown's book, Behind the Black Door. It was great to meet Sarah in person after months spent chatting on Twitter and I have to admit that I did indulge in a little celeb spotting with Liz Jarvis and Annabel Karmel too! Sarah's quite an amazing lady who works tirelessly to raise awareness for charities around the world. I can't wait to get stuck into her memoir and find out what family life behind the closed doors of Number 10 is really like. As you may already know, Sarah is the keynote speaker at CyberMummy in June, so if you'd like the chance to meet her you'd better hurry as we only have around 50 tickets to this years conference left. What colour is the door to number 10 Downing Street? The competition is now closed. The winner is lunarossa. This looks a fantastic read, it on my wishlist so I'd love to win. As someone else said, I'm not a big fan of autobiographies, but this is definitely one I'd love to read. 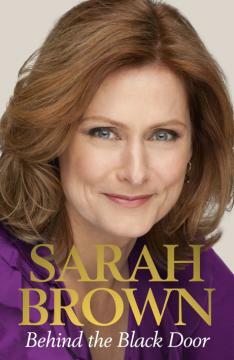 I have to say, that's a lovely photograph of Sarah on the front cover. And only 50 tickets left? Have I don't the right thing?! Thanks for hosting this comp. Thanks for the giveaway. Would love to win a copy, I'm sure it is a fascinating read. I hope I win this book. I thought Gordon Brown was the best Prime Minister we had.